Weglot offers a multilingual service to translate and display online stores in different languages, helping fast-growing businesses to be more visible, to reach more customers and to increase their sales. 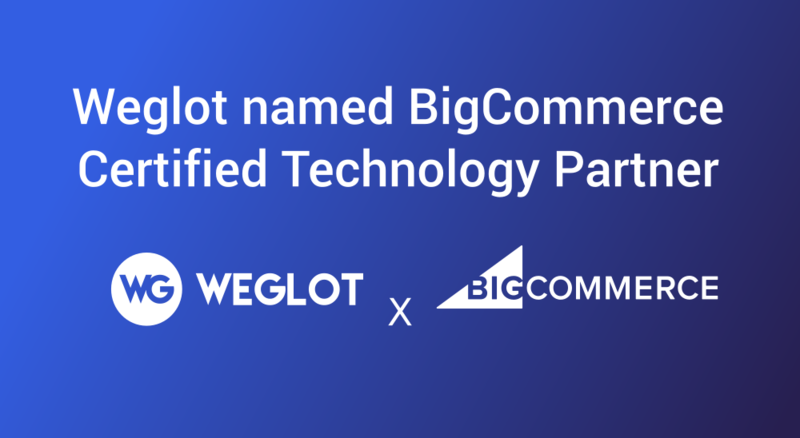 Paris, France – January 17, 2018 – Weglot today announced it has been named a BigCommerce Certified Technology Partner providing more than 50,000 BigCommerce customers access to Weglot’s multilingual and translation App. Beginning today, BigCommere customers can integrate Weglot’s App through the BigCommerce App Marketplace. “Partnering with BigCommerce reflects our continuous focus to collaborate with cutting-edge technology makers sharing our goal: help online stores to reach more customers.” said Augustin Prot, CEO and co-founder at Weglot. Adding and maintaining several languages has always been complicated and painful for website owners and developers. That’s why we founded Weglot: a powerful service to manage the different versions of your content. By default, Weglot offers a first layer of machine translations, from the best providers of the market. On your account, you can edit and improve these translations, invite teammates and collaborate with them. You can also order professional translations from pro agencies directly plugged in Weglot. Augustin is the co-founder of Weglot, a tech service for web owners and developers to make their website multilingual.